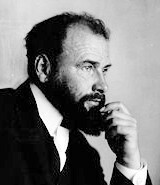 Gustav Klimt (July 14, 1862 - February 6, 1918) was an Austrian Symbolist painter and one of the most prominent members of the Vienna Art Nouveau (Vienna Secession) movement. His major works include paintings, murals, sketches, and other art objects, many of which are on display in the Vienna Secession gallery. Klimt's primary subject was the female body, and his works are marked by a frank eroticism--nowhere is this more apparent than in his numerous drawings in pencil (see Mulher sentada, below).